Thank you for taking the "Sewing Christmas" journey with me. Twelve months of sewing gifts have given me many gifts to share not just at Christmas, but over the course of this past year as well. 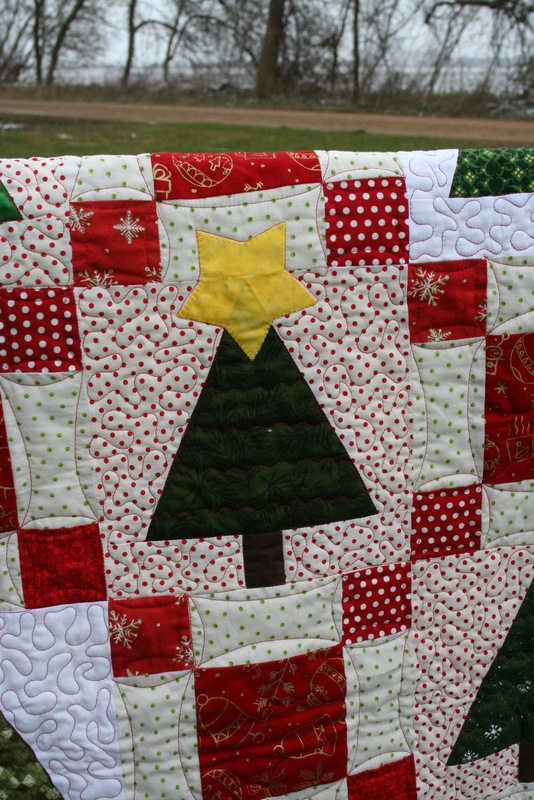 For the next three days I will be sharing quilts I made as presents this Christmas. My family celebrated Christmas yesterday with my husbands side of the family. I made these two quilts for my adorable nephews, Benjamin and Nathan. 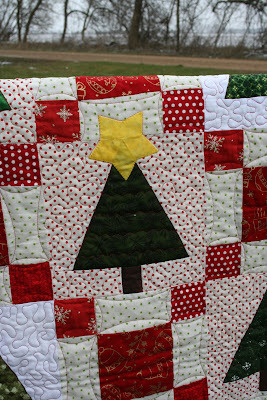 The pattern is "One Star" from the book, "Make Room for Christmas Quilts" by Nancy J. Martin. I took these pictures on Saturday, out at Friendship Farms, the outdoor wedding site that I work at. It was very cold and snowing, a perfect time to snap these photos. Mary, my quilter and friend did an awesome job of quilting. Each one is quilted differently and show-cased the pattern wonderfully! These are my cutie-patootie nephews that I made the quilts for. I told Benjamin (in the glasses) that when he is snuggled under his quilt on Christmas Eve, I want him to remember how much I love him. For us quilters, the gift of a quilt is a true expression of our love. I made a rag quilt for my sister and a quilted wall hanging for my stepmother. All the men are getting fudge and peanut butter cookies. Have a merry Christmas! What precious, memorable gifts. Did you find that since you started a year ahead that you made more gifts this year or that you were less stressed? The recipients will be thrilled! What a wonderful way to plan for Christmas. 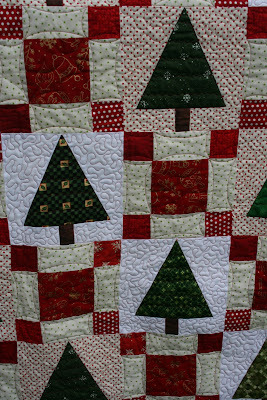 My Christmas sewing is usually crammed in the month before the big day - I like your way much better! And those quilts are lovely. I bet they will cherish them for many years to come. Your quilts are wonderful! What lucky little boys!! I absolutely love the dark border on the Christmasy red/green quilt! I have repinned this when I saw it on Pinterest. I hope you and your famkily have a wonderful Christmas. Wow, both are beautiful. What a treasure. Thanks for stopping by and for the sweet comment about the woodsy cake plate. Your quilts are an amazing showcase of art! Very beautiful! How blessed each of your loved ones are who will receive one. WOW! I haven't really sewn much this year for Christmas gifts (even though I bought some adorable fabric). They will have to come after Christmas! I have been wood-crafting (with my hubby's help), and word burning a few gifts. One of the cake plates will go to our neighbors who helped us cut down our tree that was leaning and needed to be removed. My other gifts are mixed-media paintings, one for my mom. Some of our gifts will be home-baked (cookies and fudge). I hope you and your family have a joyous Christmas celebration...filled with God's love & peace! Your Christmas quilts came out so nice. You are so talented. I still want to make a quilt one of these days but have never tried it. I want to wish you a merry happy and blessed Christmas for you and your family. Sweet! Loved it; kids and quilts alike. Thank you! Darling nephews and lovely quilts! I must make that quilt! Just added the book to my Amazon cart. Thank you for including the source for the pattern. Just the cutest quilts! Did you use a plaid for the border? I couldn't quite tell. I'm also adopting your idea to work on things al year for gifts. Thank you for your inspiration! Your quilts are wonderful, Renee. 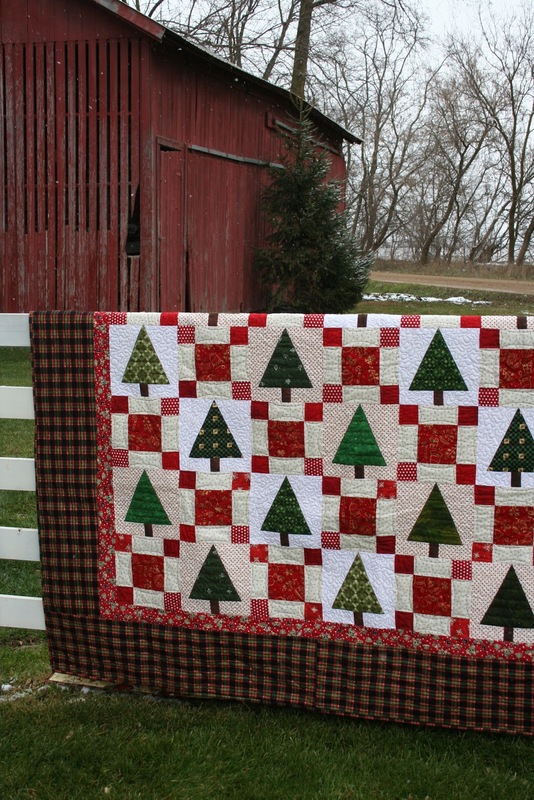 There is just somethin so cozy about Christmas quilts. Blessed little boys and so cute too. Wish I could contribute today. I did make all my girls Christmas dresses, and am now making American girl dresses to match for their gifts, but alas...no time to stop and take pictures. I have enjoyed joining you some and it was great inspiration to get some presents done. Thanks so much for hosting and if you decide to do it again, I will join in.